While race certainly plays a role in all this — the group in question is denoted as white evangelicals, after all — it’s not the whole story. On the one hand, the exit poll found Romney won 59% of white voters. But on the other hand, using the PRRI data, the correlation between the white percentage of the population by state and its support for Romney is only .35, far less than .65. 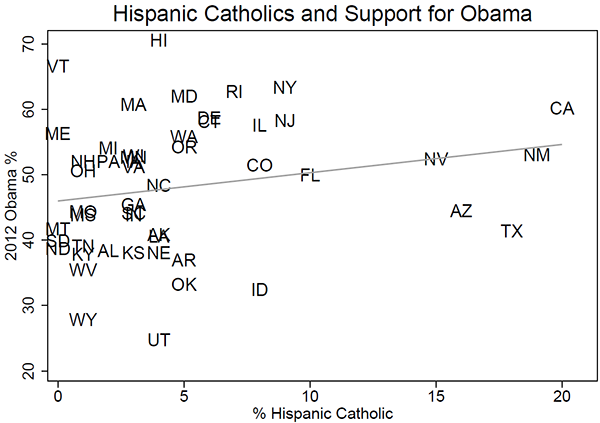 Charts 3 and 4 display simple regression analyses of the Hispanic and white Catholic percentages in each state compared with 2012 support for Obama. Examining the state-level Hispanic Catholic numbers and support for Obama doesn’t tell us much, even though the exit poll found that 71% of Latino voters cast ballots for the Democrat in 2012. The correlation between the percentage of the population that identifies as Hispanic Catholic and 2012 support for Obama is weak, .21 (Chart 3). Only six states have 10% or larger cohorts of Hispanic Catholics, meaning their overall voting influence on 2012 state-by-state outcomes was relatively small outside of the few states with large Latino populations (e.g., California or New Mexico). Texas, with the third-largest percentage of Hispanic Catholics, still went solidly Republican in 2012. We can only assume Texas Latino voters went big for Obama again in 2012 — he won 63% of the group’s vote in 2008 there — because regrettably there was no exit poll for the Lone Star State in 2012. Examining white Catholics tells us a little bit more. 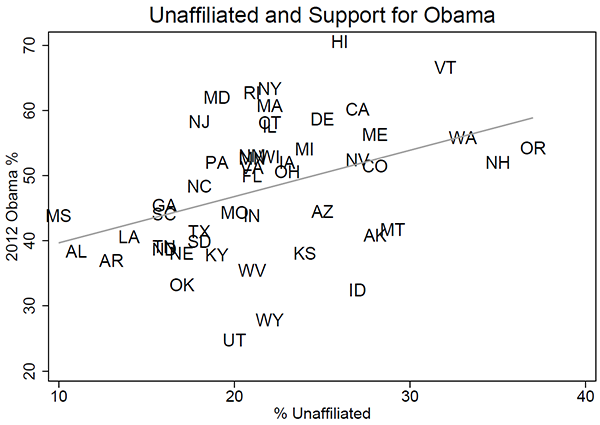 The correlation between the percentage of the population in each state that identifies as white Catholic and 2012 support for Obama is .43 (Chart 3). While the correlation is mild in strength, it’s much stronger than in the case of Hispanic Catholics. The moderate correlation follows the logic that white Catholics are, on the whole, more inclined to vote Democratic than Republican, at least compared to their white evangelical counterparts. 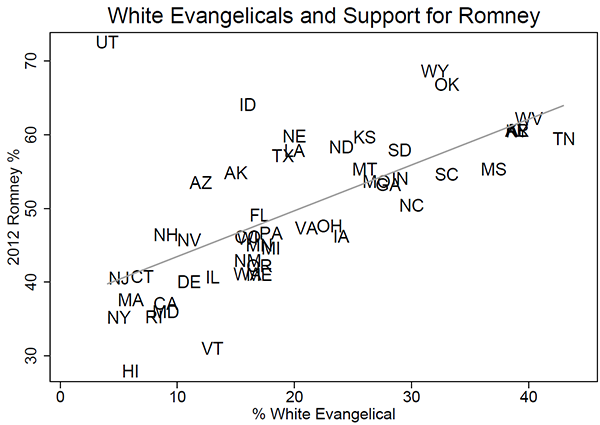 White Catholics voted for Romney 59%-40% (about the same as whites as a whole) versus the 78%-21% Romney edge among white evangelicals. 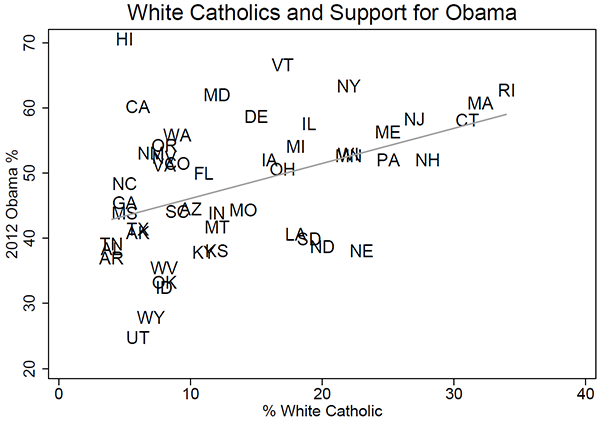 So while Obama didn’t do well among white Catholics, he unquestionably did better among them than white evangelicals. Looking at the states, the three with the largest white Catholic populations — Rhode Island, Massachusetts, and Connecticut — are solidly blue and are the only states that are at least 30% white Catholic, meaning that those states’ white Catholic populations have the size to clearly influence statewide voting outcomes. Of the states that are at least 20% white Catholic, only North Dakota did not back Obama in 2012.